I had experienced many problems with my Big Seven brakes or lack of, but after our recent trip to Ireland and two complete failures, I thought it was about time to try and improve them once more, as my wife insisted that I fix them good and proper or she would not travel again in the little car. After many phone calls and discussions to establish causes of failure, it finally was revealed that many Ruby and Big Seven owners have the same problem, [Big Seven cars weigh in at just under 16 cwt (750Kg approx)] which is twice the weight of a box saloon. Most owners seem to keep the facts to themselves and drive their cars very carefully and try to avoid using the brakes, therefore leaving nothing of the safety aspect for themselves or any other road users. I have tried many times to alter the brake shoes/brake set-up to try and improve their efficiency, but to no avail. On a recent MoT visit, the car sailed through its test and the brakes were commented on for their effectiveness. Little did the MoT test inspector know, that once the brakes reached a high temperature, their stopping power was absolutely zero. Modern brake materials used today are of course asbestos free, but as our Austin cars use a mechanical braking system they do not allow sufficient pressure to the shoes in order to stop the vehicle. Modern car brakes are very efficient and are only used for a short period of time, therefore the shoes do not become hot and therefore ineffective. I have however now tried different brake lining materials in the hope of establishing a better grip and eliminating brake failure when they are hot. One such material in particular performed exceptionally well and is desirable to fit if you are in any in doubt of your cars ability to stop. My Big Seven has sat in my new garage on axle stands for some 3-4 weeks where I have been studying and changing set ups to increase the braking. 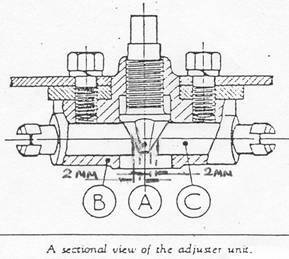 One such method was to extend the brake arm out side the back plate in order to increase the leverage but to no avail. One member called in and made a chance remark that the brake shoes do not appear to open very much when operated and that evening I just sat on the floor of the garage once again pulling the front brake cable and just checking the amount the shoes parted. Then starring me in the face were two problems one that the centre cone in the brake expander, did not move the brake shoes until the cone was approximately 1/8” depressed in and secondly when the brake cable was pulled hard the fulcrum arm hit the main cross member. This second problem appeared the worse as the harder the brakes were applied, it would make no difference to the braking as the arm had come to a dead stop. I was horrified that I had driven the car for 16 years and that I had not spotted the problem before and that I was considering changing the whole brake set up to hydraulic. The brakes were then stripped completely again, removing every part from the front back plates, so that a very close examination could take place. I did not find wear on any component especially the front brake cones or rollers. I was still baffled as to why the brakes still were inefficient and I thought that drastic action was called for before changing to a hydraulic system. I decided that I would change the roller diameter on the front brakes from what was .312” to .390” which was the size of some harden steel bolts I had in the garage. These rollers were made using an hacksaw and filing, and then refitted to the expander for a temporary experiment. It was now raining hard and I thought it would not be right and proper to start driving down the road and slamming on the brakes so I drove to the end of my new double length garage and drove forward with as much speed as I dared. To my astonishment the car stopped immediately the brakes were applied but unfortunately my garage has a carpeted floor which had now moved from one end to the other. Never mind it looks as I have solved the problem and then the next day I tried the car out on the road with spectacular results. The car for the first time in 16 years braked in a straight line and the wheels locked up, if over enthusiastic with your right foot. Now it only remains to change the rear shoe set up and balance the front to back arrangement, in making the rear shoes come on just before the front to try and avoid any veering from left to right. or skidding. The braking design has no real faults other than the ones I have described above and yet I cannot believe that the car left the factory in the fashion I found it? I will now attempt to describe my brake change procedure so that others may consider to copy or not as slight modifications had to take place to enable the brake hubs to be refitted to new shoes as a slightly larger shoe diameter is produced. First jack the car up from the ground and settle down onto axle stands and remove all four wheels. Slacken of the brake adjusters until you can nearly remove them. Disconnect the front brake cable. Remove the brake drums and soak in petrol to remove any grease or oil contamination, cast iron does have some residual absorbency of oil, so it pays just to be safe. Remove the brake shoe retaining springs and remove the shoes. Remove the brake adjuster assembly and brake expander unit. At this stage clean the entire back plate/stripped expander unit and brake adjuster. Next thoroughly check that the hub bearing oil seals are not weeping and have not been affected by over-heating front or rear shoes. (Make sure you re-grease the plunger before re-fitting and they are free from any burrs). Re-fit the brake adjuster and lock into position. Re-fit the front brake cable assembly. Re-fit and worn clevis pins ensuring that all split pins are renewed. Slacken off the nuts on the brake expander, ensuring that the unit is free for centralisation. (Grease the back of the expander before re-fitting)). Re-fit the brake drums and now ask the good wife or friend to jump into the car and apply the foot brake a few times and hold down. While the brakes are applied secure the brake expander unit, allowing the shoes to be centralised in the brake hub. This is very important to carry out as the shoes may only make contact in half of their circumference with the result that the brakes will only be 50% efficient. 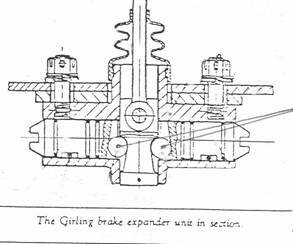 Now slacken of the nuts on the brake expander by at least one complete revolution, so that the unit will allow itself to centralise on every braking instance. Make sure that all split pins are re-fitted. The last operation is to now adjust the brake shoes and brake cable, making sure that each wheel still revolves freely when spun after adjustment. This adjustment may take a little patience, as the new shoe lining and new rollers may cause the hubs to rub on the shoes. Do not grind the end of the shoes to make them fit. Re-fit the road wheels and remove the car from the axle stands and take the car for a test drive, stamping on the brakes many times to settle them in. (CHECK YOUR REAR VIEW MIRROR BEFORE YOU START TO BRAKE). With the car now back in the garage finally adjust the brakes to ensure they are balanced if necessary (rear on first and side to side). This must be done to ensure the car pulls up in a straight line, otherwise it can veer violently to one side and may cause an accident. In my experience the front and rear shoes may be at least two or three adjusting notches between the left and right side, to ensure an even balance. This article, written by Trevor Sharp, appeared in CA7C Seven Focus in Mar 2004 p12-15.